This post is also available in: Dutch. ‘Cacti’, that’s the answer you’ll most likely get when you ask any tourist or even a visiting ‘Yu di Korsou’ what characterizes our ‘mondi’. The answer is a little shortsighted, but you can not blame them. The most picturesque plant on the island is indeed the cactus, and especially the columnar ones. Kadushi’s, Datu and Kadushi di Pushi’s are the three species of native cacti you will encounter at various places on the island. For those who do not know them well, they are difficult to tell apart. They all have long arms with numerous spines. But if you take a better look you will soon discover that they really are different. To begin with, we will look at the Datu. In the past this species was often used to construct the so-called tranké’s, which are field fencings to keep goats in or out. The goat farmers wanted to keep the goats in. The farmers, in turn, had to protect their laboriously cultivated food crops. Especially on Band’abou and in some places on Band’ariba you will still encounter those fences, usually overgrown by other plants. Often these structures are carelessly destroyed because of road widening projects or underground cabling deployment. The reason the Datu was used for this specific application was the special growth features of this plant. Instead of producing a single trunk with lots of branches, the plant usually grows in separate stalks which stand upright and neatly in line. This makes it, especially with older cacti, fairly easy to identify this species. In the past, people used to cut of the top section of the branches which were dug in neatly lined up side by side, and so the necessary fencing sections between fields were created. The ribs of the branches carry rows of rosettes of seven to eight gray-white spines that are relatively short and thick compared to the other two species. The flowers of the Datu are light pink to creamy white in color, and will open during the night, just like those of the other two columnar cactus species. The characteristic by which you really can identify the Datu is the fruits. 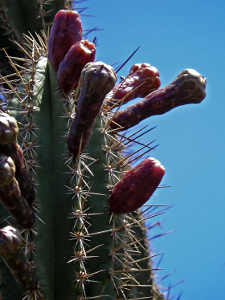 These are not only dark red in color, they are full of spines, a feature which the other two cacti species do not have. Locally, the fruit is called a dader and is still a favorite fruit for many people. Many birds love it, you often see the Trupial or Parakeet skillfully pick off the spines in order to get to the juicy flesh. The best known columnar cactus on the island has to be the Kadushi, known from the local dish which is prepared with fish. The Kadushi can be identified by the fact that it behaves like a real tree. It forms a trunk, which is usually reddish brown in color. Branches will spread out from the top and over time result in a dense crown. The spines of Kadushi are long and thin and positioned in groups of 8 to 20 together in rosettes. The fruit is oval in shape and is green, red or purple. This so called Tampañá carries no spines, and this fruit is eaten by humans as well as animals. The Kadushi di Pushi is the most illustrious of the bunch, most people can not even remember that they have ever seen this plant. The most striking characteristic of the Kadushi di Pushi is the “blond wig” on the tops of the branches. In some periods these hairy tangles cover the tops. The color of the plant is also different, more grayish in color compared to the green of the other two species. The fruit is the most characteristic, grayish green in color and relatively flat shaped. It often seems to hide within the sets of branches of the cactus and carries no spines. In shape, the fruit resembles a fig. The Kadushi di Pushi (Pilosocereus lanuginosus). The fruit has been eaten. 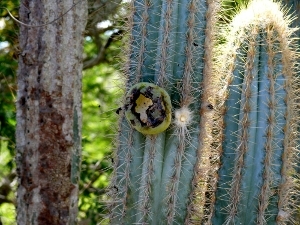 Despite the fact that cactus fruits are popular with the locals, they are perhaps the most popular with the fauna of the island. Iguanas, Trupials, Chuchubis and Parakeets feast enthusiastically on the juicy fruits which are mainly present during the dry season. The columnar cacti are one of the few plants on Curacao that carry flowers and bear fruits during the dry season. This is possible because of pollination of the flowers by nectar- and fruit-eating bats, the main pollinators of cacti on the island. The cacti are an indispensable element of nature because they ensure that our wildlife can survive in difficult times. Without this food source, survival is impossible for many. 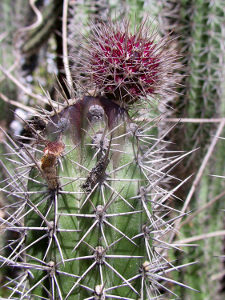 For this reason, the pillar cacti are described in biology as ‘keystone’ species. These are key species that ensure that nature can continue to function on the island. Without these species the whole system would collapse. A cactus is a tree – with built-in security …. Cacti are considered to be trees, and in fact we can say that we have cactus forests on Curacao. Just like ‘normal’ trees they have roots, a long pencil-root that penetrates deep into the ground, and surface roots that spread out just below the surface over large distances in a radial fashion, which become active as soon as raindrops fall. They have a trunk, branches, flowers and fruits. And they have leaves. The average tree as we know it has leaves that are quite thin and are evolved is such way as to make the best use of sunlight for photosynthesis in the chloroplasts that are located in the leaves. Cacti, however, have evolved in areas where it is very hot, and where leaves are at risk of burning to death. In these areas a scarcity of food often results in a high level of predation. Succulent leaves are an invitation for predators to consume them. Cacti have developed a solution for this danger. Rather than suffer from dried out and eaten leaves, the plant has moved its chloroplasts to the branches and transformed the leaves into spines. The sun’s destructive influence is lessened, and the cactus has the perfect defense against hungry animals. A green Kadushi-fruit being eaten by an iguana clinging nonchalantly to the prickly branches. Yet, they are nibbled at! Earlier parts of this series already mentioned that nature is not static at all. Although cacti evolved spines to protect themselves against predation, animals developed ways to tackle these spiny carriers of goodies. The iguana is an excellent example. 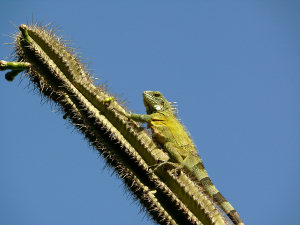 With its hard thick abdominal skin climbing a cactus to get to the nourishing flowers and, often still unripe, fruits is a cinch for this animal. Birds have also developed reptilian-like skin on their feet. Landing on top of a cactus to enjoy the fruits is no problem for them!